I had caught the digital currency bug and wanted to experience what the future of money would be like. As with every investment decision, I only invest money I can afford to lose. There was another currency that caught my attention–Ether. At the time, one Ether was about $7.26 USD, which means I could afford to purchase more Ether than BTC. It wasn’t strictly a numbers game. One of my rules for investing is don’t lose money. And my second rule is, see rule number one. I spent my time conducting research on Ether and discovered the Ethereum blockchain. Ethereum is a decentralized platform that can run smart contracts. Smart contracts are applications that run precisely the way they’re programmed without any possibility of downtime, fraud or third party manipulation. With Ethereum, you can create a smart contract that releases funds to your bank account if you complete the terms of the contract. No middlemen necessary. That is incredibly powerful. The Ethereum blockchain convinced me that Ether would be a better long term investment than Bitcoin. After researching reputable companies to purchase and sell digital currencies, I settled on Coinbase. I signed up for Coinbase and purchased my first Bitcoin and Ether. Purchasing digital curreciences with Coinbase took about a week to be available in my Coinbase account. I’ve primarily kept all my currencies without selling any. Advantages of using Coinbase is the simplicity of signing up for an account and using their mobile app. It’s really simple to buy and sell currencies as well as monitor your currency portfolio. Prices change in real-time. At the time they only supported Bitcoin and Ether. 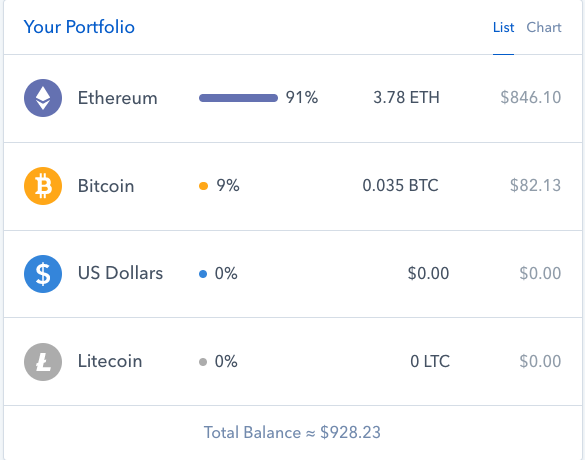 Now Coinbase supports Litecoin (the silver to Bitcoin’s gold). If you’re a conservative investor do not invest in digital currencies. Their prices are highly volatile and the reasons that affect the Forex markets are not necessarily the same reasons that impact the digital currency markets. Conditions that can favorably impact Bitcoin are institutional investors purchasing Bitcoin for their portfolios, being able to scale Bitcoin and upgrading the existing system instead of splitting the currency into two. The rise in other digital currencies also positively impact Bitcoin which increases its value. The rise in Ether’s value I believe is a result of industry’s embrace of it’s Ethereum blockchain. As new users embrace the system, the price fluctuations are reduced and the ecosystem becomes fertile. Ether is an application platform so it makes it easy for software developers to use the technology to create their own digital currencies or smart contract. Some analysts are of the opinion that this flexibility makes Ether vulnerable to being cloned. I appreciate it’s openness and believe it will thrive. Although my portfolio has lost some value with the recent decline of Ether and Bitcoin, I’m still very bullish on both currencies and intend acquire more. Who knows, I might even purchase some Litecoin. Disclaimer: We actively write about the themes in which we invest: digital currencies, artificial intelligence, robotics, virtual reality, augmented reality, clean energy, cybersecurity and alternative investments. From time to time, we’ll write about companies that are in our portfolio. Content on this site including opinions on specific themes in technology, market estimates, and estimates and commentary regarding publicly traded and private companies is not intended for use in making investment decisions. We hold no obligation to update any of our projections. We express no warranties about any estimates or opinions we make.